Updated: 2 December 2016. 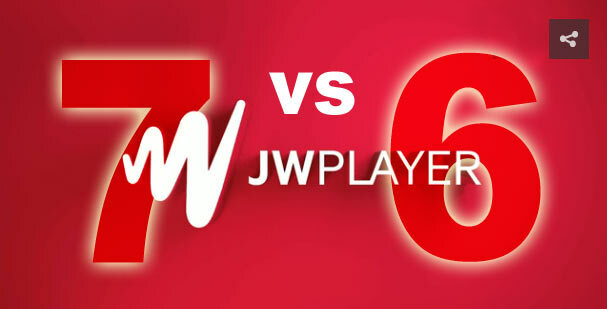 A comparison between JW Player 7 and JW Player 6. What are the differences? Do you need to update your embedding code? Price policies and other changes explained. Updated 10 November 2015. What is the difference between JW Player 6 and JW Player 7? With JW Player 7, the company JW Player in New York clearly goes for the big enterprises and organizations. And this has in the long run its consequences. For instance, although RTMP streaming is still supported, they hope to depreciate it in the (unknown) future. RTMP streaming has namely two problems, it cannot pass company firewalls and it has to switch to progressive download on mobiles via the HTML5 fallback method. In other words, videos do not play in governmental environments and other large organizations. Therefore, JW Player 7 introduces MPEG-DASH which can play on more devices in HTML5 mode than HLS streaming, although quite a few borwsers do not support it yet. Both methods can circumvent firewalls. However, it remains to be seen whether RTMP will disappear because RTMP streaming remains quite popular as it is easy to implement and gives good results. Fact is, that the video industry changes all the time, predictions are in that sense a little pointless. NOTE: RTMP will be deprecated soon! 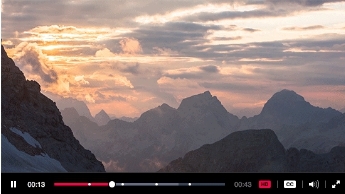 Media formats Video: MP4, WebM and FLV. Audio: AAC, MP3 and Vorbis. RSS feeds, using enclosures or the Media or JWPlayer extension. 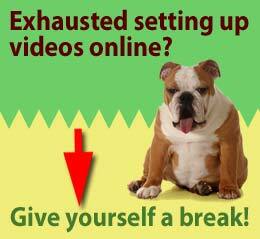 Video: MP4, WebM and FLV. Enable/disable Full screen button: Yes No, full screen cannot be prevented. HTML5 Fallback for RTMP Yes Yes, based on source order. No longer a separate tag. * From version 7.2 onward, you can again customize the context menu although you cannot remove the link to JW Player. The watermark is also available in all JW player editions and from version 7.4;3 onward, the 4 positions top-left, top-right, bottom-left and bottom-right are again possible. Important to note is that JW Player 7 performs faster than version 6 due to a couple of improvements, like skins are lighter, and Flash is only used when needed. HLS streaming and MPEG-DASH require a yearly JW Player Premium license of $299 at this time of writing. HLS streaming was already supported in the Premium version of JW Player 6, but this method is actually quite problematic as not all Android devices support it properly. JW Player believes, or rather hopes, that MPEG-DASH will replace HLS and RTMP streaming in the future. This remains to be seen, of course, but a fact is that MPEG-DASH is gaining support, although not supported on all browsers yet. HLS adaptive streaming will replace RTMP streaming quite soon(see also Flash support in Google Chrome under fire). MPEG-DASH and HLS Adaptive streaming powerful as these options may be, it is not for beginners because it is more complex than RTMP streaming and the cost is higher in terms of data transfer and encoding. However, nothing stops you from using RTMP, as long as you provide an HTML5 falback to progressive download. But let me repeat, the RTMP days are numbered as it requires Flash. These options were not available in the free JW Player 6 version. The context menu is no longer fully customizable. The “About JW Player” cannot be removed unless you change it in the jwplayer.js file itself, but this is officially not permitted by JW Player, so be careful. 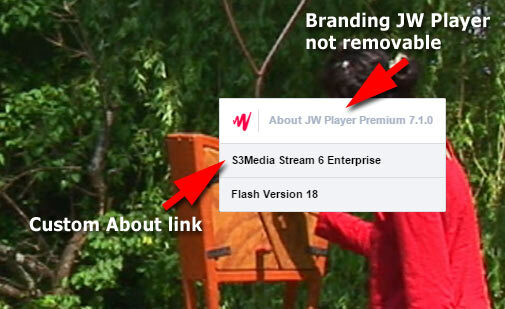 To place your branding underneath the JW Player link, you no longer need the Premium license. Watermarks have just one position, namely top right for versions older then 7.4. There is luckily a way to override this with CSS by adapting a skin using the .jwlogo class, but this requires some tinkering, so best upgrade to 7.4 or higher because it features again the 4 positions top-left, top-right, bottom-left and bottom-right. The good news is, watermarks now show up properly on mobiles. The skins are much lighter, therefore they load faster and give better support across mobile browsers. The only drawback is that you cannot use fancy textures anymore because it is all css, although it may be possible to load a texture image with css, it would slow down display. There is generally a misconception that everyone can use the free player, but this only counts for non-commercial sites. Contrary to what I wrote previously (before this update): JW Player now decided that the free player will be free for all, regardless whether your site is commercial or not. This is very good news! Does embedding of JW Player 6 still work? Skins need to be replaced by the JW Player 7 versions, which are fully css based now. Therefore, if you made any custom skins for version 5.10 or 6, you need to redo those. If you don’t do that, the default skin “Zeven” will be shown instead, so nothing breaks there. What about JW Player 6 Pro or Premium customers? Existing customers of version 6 can continue to use the plugin and they will be charged each year by JWplayer.com for the regular fee as usual. They can decide to upgrade to JW Player 7 via the dashboard of their account. If you had a Pro version, you are no longer charged. If you had a Premium version, the pricing remains the same, but you have more functionality. Free users can do this as well and profit from a couple of Pro features as explained above. Finally, it is important to note that JW Player 7 still has some small child diseases, therefore it updates frequently currently. Alas, with some updates, features disappear or re-appear. As mentioned earlier, the last change is that watermarks are no longer part of the free version 7.1.4, but will be again available in the 7.2 version. What can we say further about this player? Well, we can only say it is excellent. This is a sturdy industry standard video and audio player which supports most mobile devices, gives loads of options to display media and it is relatively easy to implement on your site. JW Player 6 embedding code still works with JW Player 7, which is a big relief for those of you who have loads of media embedded already. Finally, it is possible to change colors of a skin via the embedding code and the API to change the behavior of the player has been improved as well, but the latter is advanced stuff. Our recommendation is, that if you use an older version of JW Player, switch to JW Player 7.